I can’t help but chat with people about buildings. The subject comes up in conversation so easily, especially with strangers. Why talk about the weather when we are surrounded by such intriguing architecture? Regular readers are probably now aware that I have just been elected onto Brighton & Hove City Council. It has been a long slog but well worth the years of effort. My greatest passion is of course the built environment and, as a Councillor, I would hope to have positive influence here. My first foray into King’s House, the council’s headquarters on Hove seafront, was inevitably a chaotic experience. There is a lot to take in. There are tens of council officers whom I need to get to know, who are scattered around the vast office complex. My tour inevitably led to me asking to see some of the hidden areas. I can’t help but talk architecture. King’s House is actually a collection of buildings, unbeknownst to most residents. It was originally designed as a terrace of seven houses. Corridors have been knocked through the thick party walls to make one integrated space (similar to the way in which four terraced houses became the old Sackville Hotel). The south-west corner was most interesting to me. Its tower is certainly the most important feature. 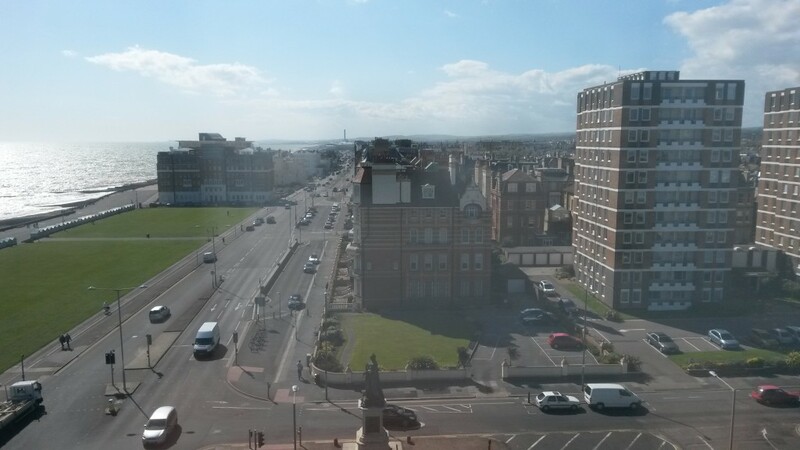 There are no other eight storeys structures in Hove in fact. 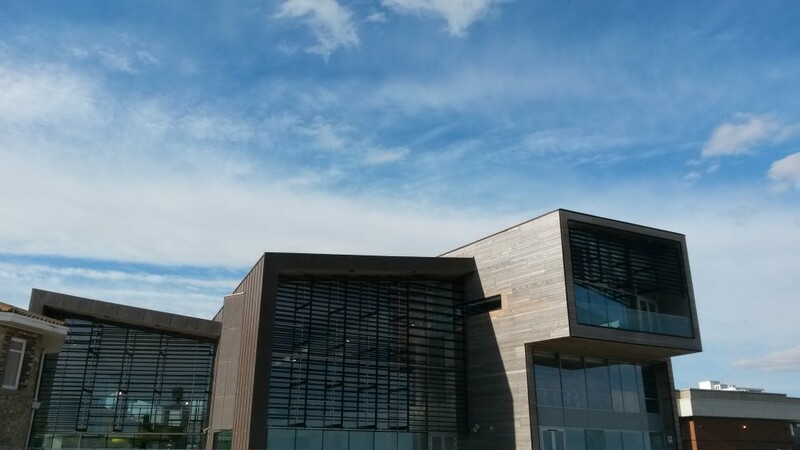 The tower office is home to the council’s major projects team – who have the best jobs and views in the council, but the largest number of steps. 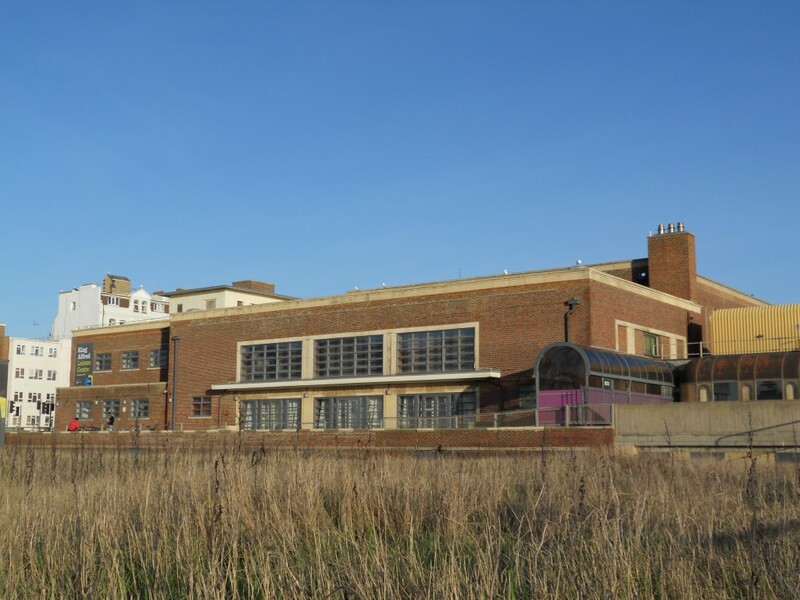 I will be looking to ensure that the right focus is put in getting major projects off the ground, starting with the King Alfred Leisure Centre in Hove. I hope to be able to talk about fine modern buildings, not just about our wonderful historic offerings. Having just been elected onto Brighton & Hove City Council as Councillor for Wish Ward in Hove, it seems only appropriate that I focus on Stoneham Park in my patch. What began as Portland Road Recreation Ground in 1913 was later called Stoneham Recreation Ground. It is now called Stoneham Park, officially, having been reopened in 2001 by the then Mayor of Brighton & Hove, Cllr Harry Steer. The land that became the park initially served Hove as a gravel pit. It was gifted to the town by the Duke of Portland in 1906. For a while, it housed a captured German gun. Pigeon-feeders were the menace during the 1990s, and vandals during the 2000s. It is now both delightful and thriving. To the west of Stoneham Park is Mainstone Road which takes its name from Frank Mainstone, the Duke of Portland’s bailiff. Mainstone kept pigs on the land that became the park. To the north, Stoneham Road has a long-standing association with the baking of bread which continues to this day. 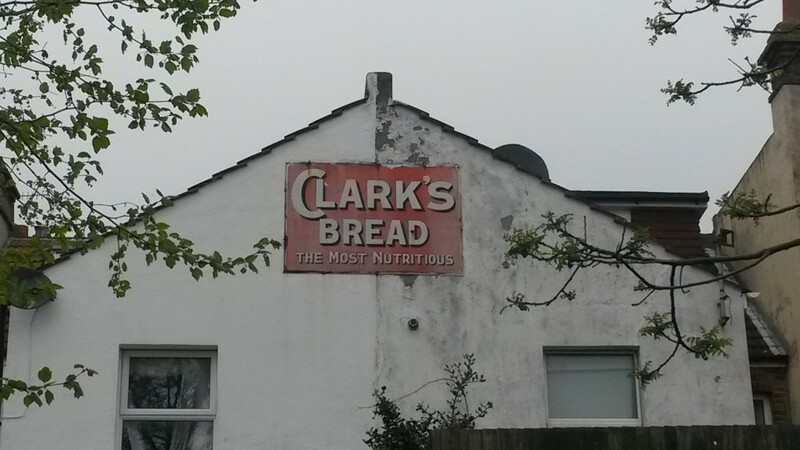 A sign on the rear of two houses backing onto the park mentions Clark’s Bread (“THE MOST NUTRITIOUS”) which operated during the first third of the twentieth century. The background of parks locally is interesting. Wish Park opened in 1900, Victoria Park in 1902 and Hove Park in 1906. It was a golden era for public areas, against a backdrop of the green spaces of Hove and Brighton’s squares and crescents originally being private and exclusive. 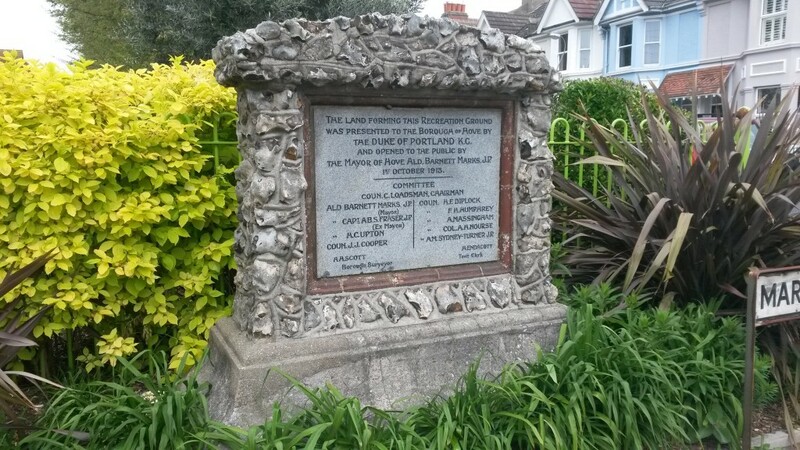 My favourite bit of Stoneham Park is a granite memorial plaque in a grotto-like flint surround on the south-east corner which Judy Middleton describes as ‘a haven for local snails’ in her Encyclopaedia of Hove and Portslade. Judy counted fourteen snails on her visit in 1994. I was disappointed to see only one. Following the success of Worthing’s first Eco Open Houses event last year, a second has impressed just as much. My column on the event one year back focused on the Lancing Beach Building – a huge eco-tistical shell of fun right on the Lancing beach. My visit this year was to an even bigger beach building – the newish Splashpoint leisure centre on the Worthing seafront. As usual, I wasn’t particularly interested in the standard brochure. It was the behind-the-scenes areas that caught my attention. Splashpoint did not fail to impress in that regard. Splashpoint opened in May 2013 at a cost £18 million. Its sets the benchmark for what a new King Alfred in Hove should be looking to achieve. 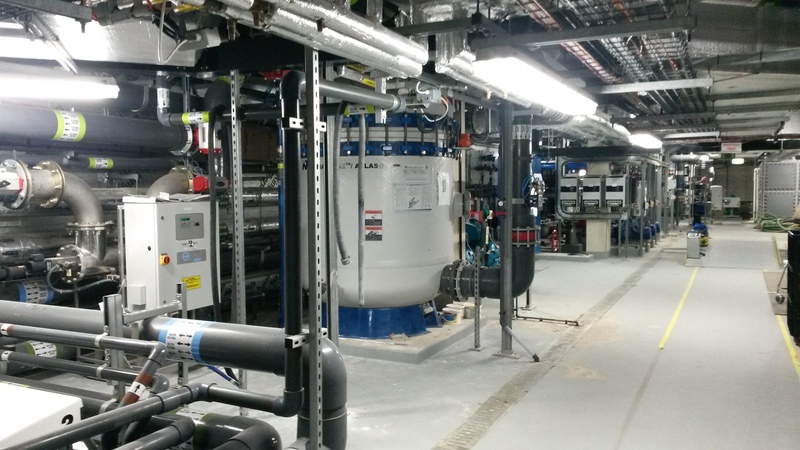 Our tour with efficiency specialist Matt Roberts started to the west of the slowly-tarnishing copper, glass and polished concrete structure above an array of pipes serving the building’s ground source heat pump. The arrangement is complex as the leisure centre needs to be simultaneously heated (pools) and cooled (gyms). Beneath much of the building, and wrapping around the lower sections of the pool is a deep basement containing all manner of gadgets that keep this highly-efficient building in check. There are pipes, tanks, motors and control panels everywhere for a variety of cooling, heating, electricity-generating, air-conditioning and filtering systems. There are even huge bags that provide a home for the lane ropes that disappear down little holes at the end of the pool. Having been involved with the campaign to get a new King Alfred for Hove from the beginning, I am embarrassed that Brighton & Hove City Council has done so little to get things moving. As such, I am certainly grateful to the Eco Open Houses team for showing the public what it is possible achieve in that regard. My last memory of the Lansdowne Hotel on Lansdowne Place was dancing to Rat Pack classics with singer David Van Day and local builder John Regan. We had a great evening but did chuckle about the state of the place. That was one Christmas some years ago. There were no doubt similar festive celebrations over the Christmas period in 2012 with the principal difference that, unbeknownst to staff, the hotel was about to close. The announcement was made on New Year’s Eve apparently. It must have closed quickly as decorated trees are still scattered around the entrance foyer. Bottles of spirits in the bar are still in situ. Uniforms still hang in the staff room. 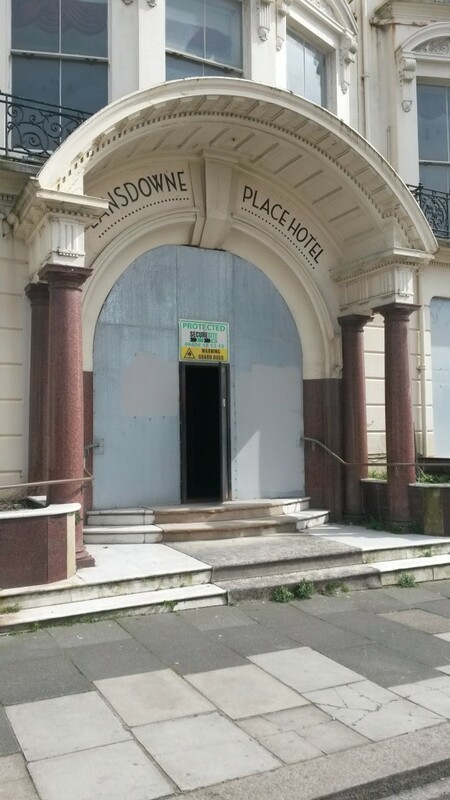 Many local people know the Lansdowne by its former name, the Dudley Hotel. Some call it the ‘Deadly Dudley’, presumably on account of the dodgy food. Few probably appreciate that the hotel began as a terrace of six distinct houses called Lansdowne Mansions. The Dudley grew from a boarding house in the southernmost of the six houses until all six were included. The street was developed from the 1820s and was originally called Wick Road. It became Lansdowne Place in 1834. There were once a number of schools on the road but the use now is primarily residential. Planning permission exists for the conversion of the 84-bedroom hotel into 45 flats. Exploring old hotels, looking for bits of history, is a fascinating task. It tends to be the case that most public-facing areas have little of interest to offer. Successive refurbishments see to that. It is the behind-the-scenes areas that give the clues – cellars, staff rooms, service staircases. 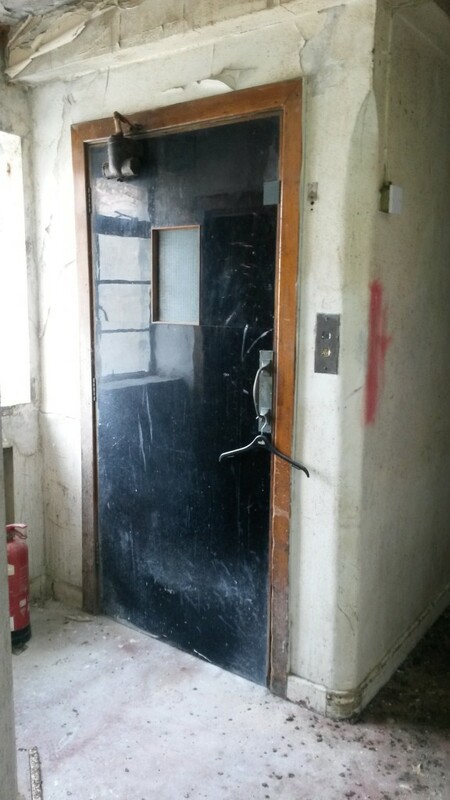 I particularly like a hidden 1930s lift at the rear. Matthew Hollywood at Mishon Mackay is marketing the building now as a development project for £8 million.